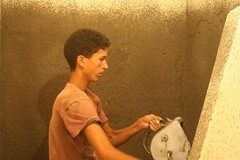 Tadelakt is a construction technique used in Morocco, that covers walls inside houses in order to give them a smooth, waterproof coat with lime plaster material. 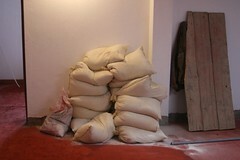 Tadelakt is often used inside traditional houses. 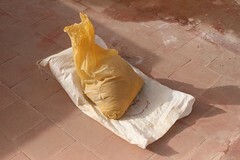 While under renovation, Dar Rita in Ouarzazate used tadelakt traditional technique to cover all bathroom walls. 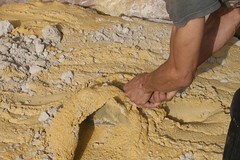 Tadelakt technique follows several steps in terms of material and wall preparation. 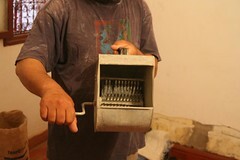 First the plater powder has to be mixed with water up to 15 hours before of the color pigment application. This process takes around a few hours to mix the lime plaster powder, water and the pigment color powder (color as you like, pigment prices vary depending on specific colors). The walls where the platter paste will be applied has to be prepared with cement and prior to cement, the walls have to be prepared with several holes in order to absorb water and the tadelakt past better. The covering of the walls with cement can be easily done with a special machine that spreads cement fast and efficiently. After the first tadelakt paste coating on the wall, there are the smoothing techniques necessary to the preservation of the tadelakt itself. First smoothing technique is made with a normal wooden shovel, and the other one with a smooth stone that will make all imperfections disappear. 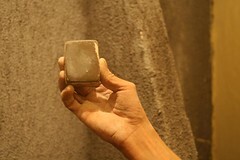 There is a posterior wall waxing procedure made with traditional Moroccan olive oil soap. Moroccan tadelakt is the perfect wall covering technique for riads patios, riad rooms, riad bathrooms and riad hammams. Riad walls get this interesting smooth look while giving the sense of traditional and old ambiance to the house. 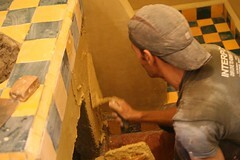 Definitely, a new or renovated riad in Morocco will make it possible to preserve tadelakt techniques in the future. 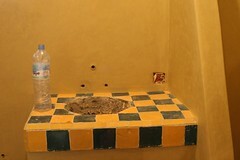 In conclusion, due to the Moroccan tourism development, traditional Moroccan techniques like tadelakt can be preserved and still making part of house construction / renovation in Morocco.